The Nozomi Shinkansen speeds into Kyoto after only two and a half hours of travel time! Too bad the stations don’t seem to have many escalators, because I had to lug all of this luggage up and down several flights of steps before arriving at the ground level and a taxi. The cab driver hadn’t a clue as to where the hotel is located, and silly me of course he can’t read the address of the hotel in romanji which I had thoughtfully provided. Kyoto streets can be very busy and the hotel is much MUCH farther away from Kyoto Station than it appears on the map. Total taxi fare came to only 970 yen – worth every yen considering the distance I would have had to have walked. Had I known, I could have taken the bus from Kyoto Station because two bus lines stop right outside the hotel. My hotel room is perhaps slightly larger than the typical Japanese hotel room. It is very nice and includes a good size modular bathroom, decent size bed, window and a black leather couch (because I got the semi double). A perfect arrangement in a nice section of town with easy access to bus lines, which I only reserved at the last minute. Win! But after settling down to some needed video editing time, I discover that this hotel has no three prong plugs, so now I need to find a “Type A” adapter and quickly. 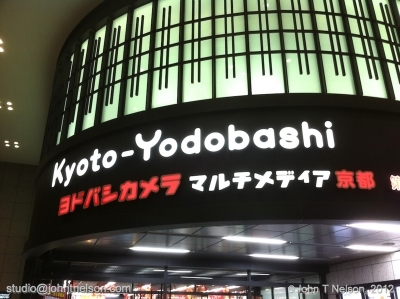 There can only be one place in all of Japan to go for that kind of gear and that’s Yodabashhi Camera and there’s a Yodabashi near Kyoto Station! 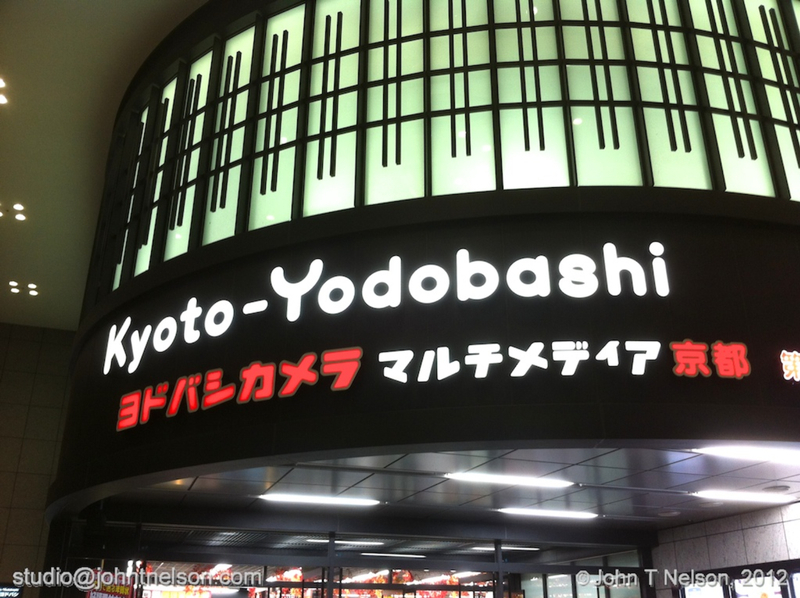 So I hoofed it down to the Kyoto Station area under a magnificent twilight sky to one of my favorite stores of all time… Yodabashi Camera! Incredibly, the greeter at the front door understood exactly what I meant when I babbled at her about “denki mono”, and directed me to the section of the store that stocks a vast array of power converters, plugs and adaptors mostly for travel purposes. Having found my power adaptor, I proceeded to the sixth floor for dinner: tonkatsu and miso soup. Yes, Yodabashi Camera is a little expensive but I still love them. Walking the streets at night also gave me an opportunity to discover where everything was in the neighborhood, the conbini, vending machines, restaurants, temples, subway and bus stops. And even at night you feel safe walking the streets as you watch families with children riding their bikes, playing in the neighborhoods, and elderly people out for a stroll. The stream of bicycles ridden by all ages and all walks of life is endless. Kyoto has two forms of transportation: 1) the taxi and 2) the bicycle, both can run you down if you aren’t mindful of the road. I get a very real sense of neighborhood and community here. I now have my Type A adaptor and am up and running again!